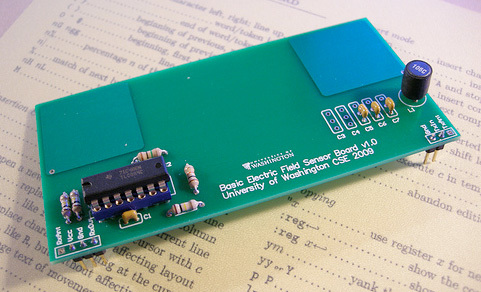 Basic E-Field Sensor Board. Designed for UW CSE Software for embedded systems class. For the lab, I developed a custom PCB that contains both the transmit and receive electrodes, as well as the resonant tank for the transmitter and the analog front-end for the receiver. Header pins along the front edge of the board enabled students to plug the unit into their breadboards for connection to their microcontroller circuits. Placing the portions of the circuit that were sensitive to layout and breadboard capacitance on the PCB enabled students to focus on the objectives of the lab assignment rather than on debugging layout problems. I designed the board to be easy to assemble; the students computed the frequencies that they would use based on the capabilities of their microcontroller and the parts available in the lab, then selected components and assembled the boards themselves. Several pads for various capacitors were provided for frequency selection. E-field sensor board in action.